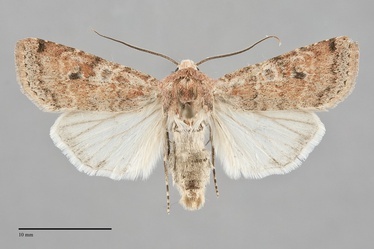 Euxoa medialis is a variable powdery mottled pink, orange, or gray medium-sized species (FW length 15–20 mm) with white male and light gray female hindwings that flies in extreme south-central Oregon during the fall. The forewing is powdery light gray, orange, or even pink with variable gray suffusion along the costa and near the outer margin. Only pink specimens have been found in Oregon, but gray ones might occur there as well since only three specimens have been collected in the entire Northwest. The median area distal to the median line is darker than the rest of the wing in a few specimens. The lines and spots are gray filled with a pale shade of the ground color, usually lacking dark components and appearing entirely pale. The basal and antemedial lines are slightly irregular, oriented near perpendicular to the wing. The median line is variable, dark gray, powdery or solid dark gray. The postmedial line is weakly scalloped, drawn toward the base on the costa, bent near the costa to run near the lateral reniform spot, weakly excurved across the mid-wing and angled toward the base. The subterminal line is pale, slightly irregular. It is preceded by variable darker shading, of the pink or orange ground color or dark gray, sometimes forming a black spot on the costa. The terminal line is also variable, thin and inconspicuous or a series of dark gray spots. The fringe is slightly lighter to slightly darker than the ground color. The orbicular and reniform spots are outlined with the pale filling of the lines, filled with even paler color or darker gray. The orbicular spot is round. The reniform spot is kidney-shaped, sometimes with a dark gray spot in the lower end. The claviform spot is absent. The male hindwing and fringe are white with faint powdery gray near the outer margin. That of the female is slightly darker gray with dark veins and terminal line. The head and thorax match the forewing. A flat-topped tubercle is present on the frons. The male antenna is biserrate. Euxoa medialis belongs to the subgenus Euxoa. 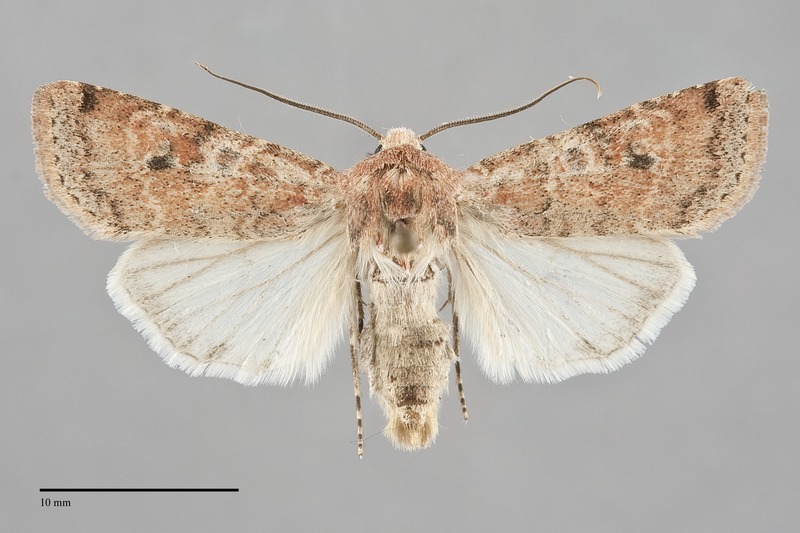 This moth can usually be identified by its mottled pink or pinkish orange color in our region. 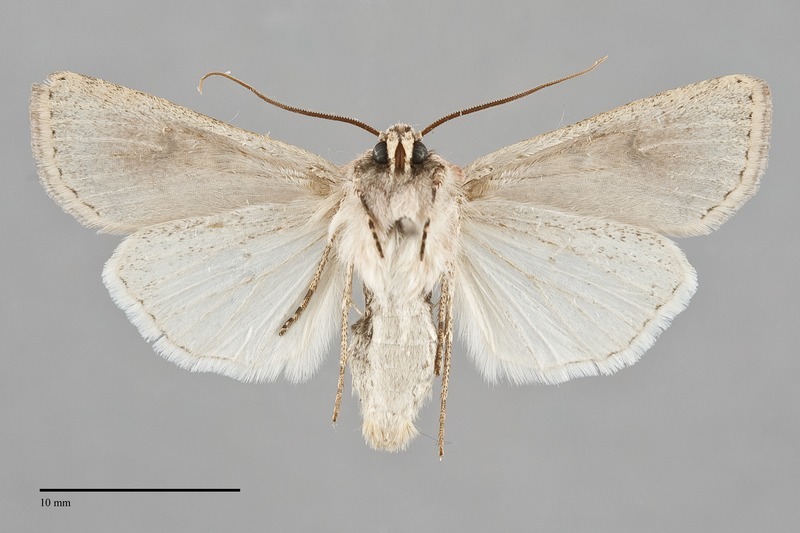 Euxoa medialis should also be considered as an identification option for a powdery gray Euxoa with a dark median line and light hindwing, especially if collected in southern Oregon or southern Idaho during the fall. This species is widely distributed on open native prairies throughout the Great Plains, extending westward into desert habitats of the Southwest. It barely enters the Pacific Northwest on dry sagebrush steppe in southeastern Oregon. The single Northwest locality for this species in Lake County was a dry wash on the east slope of the Warner Mountains. Euxoa medialis has only been found near Adel, Lake County, Oregon in the Pacific Northwest region. This species is found on the Great Plains, in the Great Basin, and California. The range extends from Manitoba and Wisconsin, southern Alberta, northern Utah, and southern Oregon to southern Mexico. The range extends to the Pacific Coast in central and southern California. Adults fly in the fall from early September to late October throughout its range (Lafontaine 1987). The only Oregon record is from late September.